Helplessly sifting through videos and articles on Facebook wasn’t going to do it for me. I was looking forward to attending an actual demonstration in DC where I’ll get to commiserate with others over the fight for democracy in Hong Kong. By now, most everyone has heard about the impressively peaceful and organized protests in various neighborhoods of Hong Kong, conducted in opposition of Beijing’s attempt to remove universal suffrage, and effectively eliminate free elections. On October 3rd I joined a small group of mostly-student demonstrators in front of the Chinese Embassy to show our support. 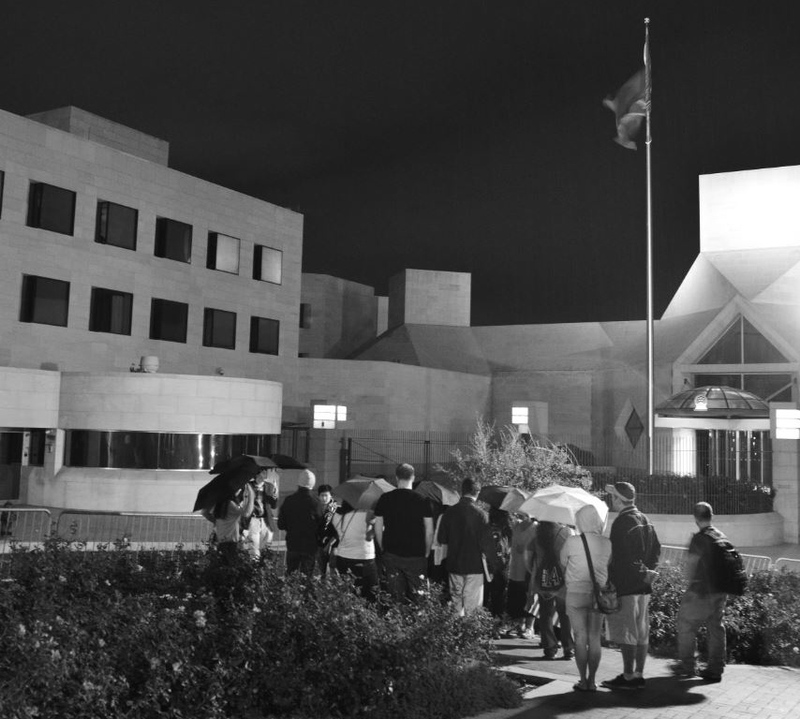 At 7pm, I trekked up a quiet, tucked away street to find the embassy with no one in sight. I was the first to arrive. I surveyed the area nearby, being cautious not to walk on embassy property, always bearing in mind what the Chinese government is capable of doing to eliminate threat. Sure, this wasn’t Beijing, and I was only one person, but my apprehension of Beijing’s reckless and brutal history remained unmoved. I remained keenly aware that behind the one-sided glass, guards were watching me survey the area, take photos of the embassy. A Chinese family, perhaps that of an ambassador, entered the premise to return home. Soon, others arrived to join in solidarity with yellow shirts and umbrellas. Coincidentally, it rained pretty good that evening. Mostly from American University and George Washington University, student demonstrators shared unique perspectives of their connection to the demonstration. A Russian-American student compared Beijing to Moscow. A Chinese-American demonstrator explained that the young people in Beijing support democracy much like we do. A Chinese-American photojournalist, native to Hong Kong, documented the night’s event. A student blogger interviewed me about the protests in Hong Kong. And an Egyptian-American student described her first-hand experience with violent protests in Cairo during the uprising in 2011. She was only 15 years old. The Secret Service decided to make an appearance. To be honest – I was quite flattered. There were in total maybe 30 of us, casually chatting with our umbrellas opened. An agent approached us to ask some questions. She was friendly enough. She wanted to know what we were doing, who we were representing, how long we planned on being there. When she asked us if we planned on having any civil disobedience, we looked at each other and shrugged. Is that usually planned? They decided that they’d park on of their agents there and sit with us until we dispersed. I joked perhaps we’d ask them to take our group picture. Except for the occasional peek out of a glass window, or a small child momentarily playing in the front lawn, no one from the Chinese Embassy engaged with us.